Situated out in lovely countryside with views of the South Downs, only accessed by car, as public transport is three miles away. Open for a few weeks each year whilst the white wood anemones and bluebells are flowering in our 23 acre ancient oak wood. Please read the visitor information or telephone 01323 485151 for the dates we are open and state of the bluebells. Beatons Wood is where one can see the profusion of bluebells and two ponds. This has a wide circular gravelled path 800 metres long, levelled and lightly gravelled to avoid it being slippery, making it suitable for those with mobility issues, and seats every 150 metres to rest and admire natures beauty. Slight incline in places but more seats available in those areas. The Farm Trail paths are not suitable either for wheelchairs, mobility scooters or those who have difficulties with walking, as in places paths can be narrow and hazardous. The Bluebell Walk started in 1972 raising money for local charities and this concept continues today, with over £1,000,000 in todays money raised to date by 74 different charities. We look forward to welcoming you. If you have any queries or require any assistance please phone 01323 485151 or email. We erect many large brown and white direction signs supported by the local authority within a 3 mile radius of Arlington Bluebell Walk, as we are very much ‘off the beaten track’. The nearest railway station with a taxi service 01323 484444 is Polegate which is 5 miles away, or Berwick 3 miles away. Both these stations are on the mainline from Victoria to Eastbourne. The nearest bus stop 3 miles away with taxis available on 01323 844464 is Hailsham, with buses from Hastings, Heathfield and Eastbourne. There is a 40 metre walk on concrete to the Bluebell Barn that has a level entrance and wide door, leading to a very large barn with level concrete floor plus ample seats and tables. A good range of refreshments much homemade, are served here by one of the 21 local charities who run the Bluebell Walk for 1, 2, or 3 days each. The Bluebell Barn has a plant stall run by Arlington Church, secondhand books to browse and purchase in aid of Action for Medical Research and a stall run by the Hailsham Old Pavilion Society (HOPS) selling ice creams, cards, pictures and other mementos. At weekends and Bank Holidays both the RSPB and Sussex Wildlife Trust have stalls to recruit and meet members, with many items for sale. Opposite the Bluebell Barn the Meeter and Greeters in high visibility jackets are there to answer any questions or queries.They are the persons who can offer anyone who have mobility issues one of the 14 mobility scooters or 4 wheelchairs which are offered free of charge. For insurance purposes we ask that the user signs when they use a mobility scooter to say it is used entirely at their own risk, they use it only in Beatons Wood and keep away from the two ponds as they have sloping sides. 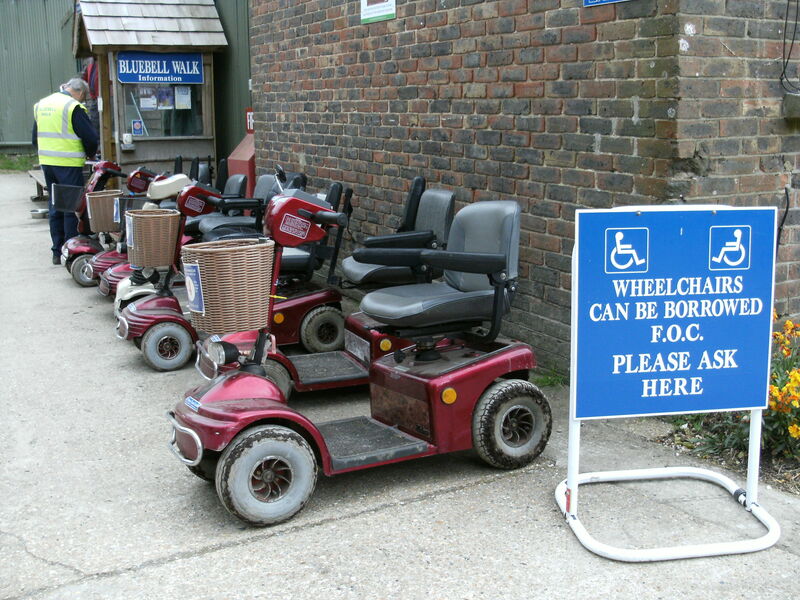 We do not take bookings for the mobility scooters, so if on the infrequent occasions they are all out, we suggest another cup of tea by which time one will have returned! 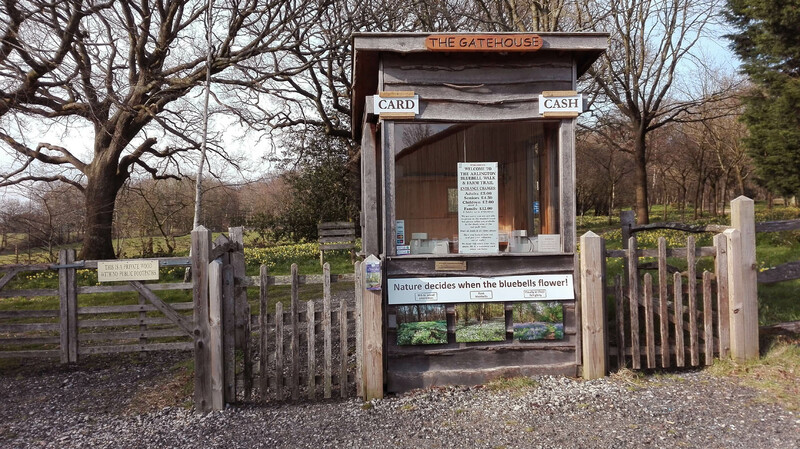 The Gate House where you pay the entrance fee to the Bluebell Walk is adjacent to the Millennium Walk, and 45 metres from the Bluebell Barn accessible by a concrete path with a slight incline. There are two payment points in which the person supplying tickets can leave their seat to assist anyone in a wheelchair or mobility scooter. Payment can be either in cash or by credit or debit card. Disabled persons who arrive with their paid carer are admitted free, but the person whom they accompany pays the full entrance charge. Dogs are welcomed but please they must remain on leads, so preventing any disturbance to the wildlife. Every visitor is offered a detailed map of the Walks when they pay their entrance fee. We do supply enlarged laminated maps for those who would like one, but ask that it is please given back to The Gate House when you have finished your walk. Around Beatons Wood we have many display panels describing the flora and fauna one might see. There is a Children’s Quiz available at The Gate House, the answers can be found on these display panels. Each year we run a Photographic Competition, with a Class for photographers below 16 years old, with no restriction on the subject of images entered, but up to 3 images per entrant. The Adult Class has four categories: Close Up of a plant or creature: Landscape of a view from one of the Walks: Mid range of person or people at the Bluebell Walk: Mid range of trees, flowers or animals as seen. Any visitor can enter up to 3 images per category and all free of charge. Prizes are as shown on our website. Last year`s prize winners are displayed in the Bluebell Barn and all winning images can be seen in the online gallery. There is a Memorial Glade in a secluded area by the Lower Pond with 4 seats in which one can sit and reflect on those who are sadly not now here. A Memorial Book situated in the Book Room adjoining the Bluebell Barn, has entries written in calligraphy recording memories and thoughts of loved ones who used to enjoy visiting the Bluebell Wood. An adjoining barn with young pigs, lambs with their mothers and some pygmy goats, which can be petted but please remember to wash your hands in the adjacent washing area. In the main car parking field in a shady corner, there are picnic tables with spaces to accommodate wheelchairs. We have one accessible toilet about 35 metres from the Bluebell Barn, with a slight incline and handrail to a wide entrance door. It is large and designed for wheelchair users. It has all the necessary rails, low level washing basin and an emergency alarm cord. This is the shortest Walk in the Bluebell Wood and is lightly gravelled to allow access for wheel chair users, but there is a slight incline on the way back. Wooden benches are situated approximately every 150 yards on this walk. The picnic tables in the shady corner of the large car park field are wheelchair accessible. See the booking form for more information.